If you are a male healthcare professional, your scrub style choices are pretty limited. You probably have a few shades of blue scrubs to choose from, most of which are made from cheap scratchy fabrics. 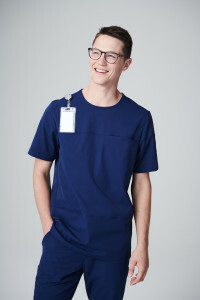 And men’s scrub tops are almost universally styled with a v-neck that is both unflattering and fairly revealing if you have to bend over and aren’t wearing an underscrub tee. 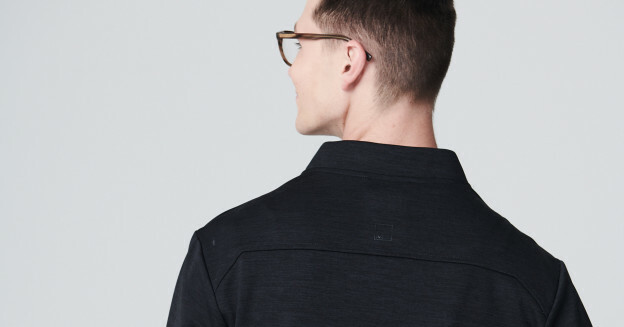 If this conundrum sounds familiar to you, we’ve got some good news: Medelita has introduced a style of men’s scrub top that has a crew neck and an athletic fit. 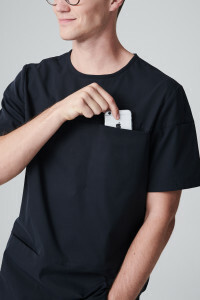 This new style, called the Radius Scrub Top, has 3 super-convenient pockets and an invisible badge pocket to clip your ID badge on the left shoulder. In addition to the purposeful design featured and streamlined design, this scrub top is made from their revolutionary stretch scrub fabric. This fabric is a real game-changer: not only is it blissfully soft and professional looking, but it has been tested in industrial laundry settings (70 degrees Celsius is pretty standard) and is able to withstand hundreds of washes without tearing, fading, or ripping. Medelita guarantees the durability of their scrub fabric – they are actually the only scrub company in the industry that offers a full year warranty on all their products, so if for some reason it starts to fall apart they will replace it no questions asked. Check out the men’s crew-neck scrub top below and let us know what you think of it in the comments! This entry was posted in black scrubs, Blue Scrubs, doctor scrubs, Medical Scrubs, Trends In Medical Apparel on January 26, 2018 by Ariel Jacoby. The best articles of clothing in our wardrobe are ones that combine style, comfort, and functionality. 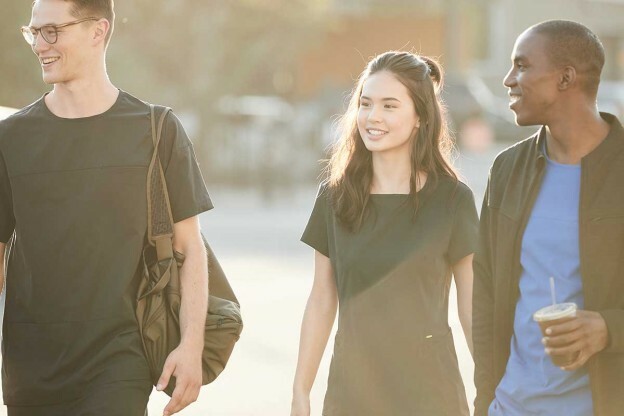 The modern medical professional needs to be able to transition easily from work to life, but it’s surprisingly difficult to find pieces that can be worn in multiple settings. 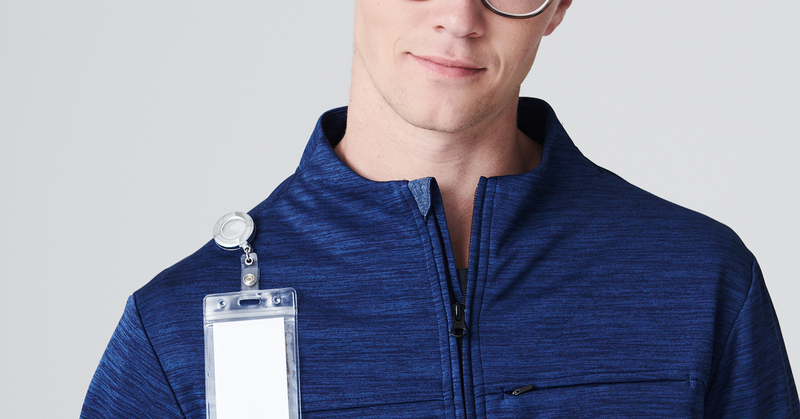 For example, my roommate, who is a Registered Nurse at LA Children’s Hospital, pretty much always needs to wear some sort of jacket over his scrubs to keep warm in the overly air conditioned hospital hallways. 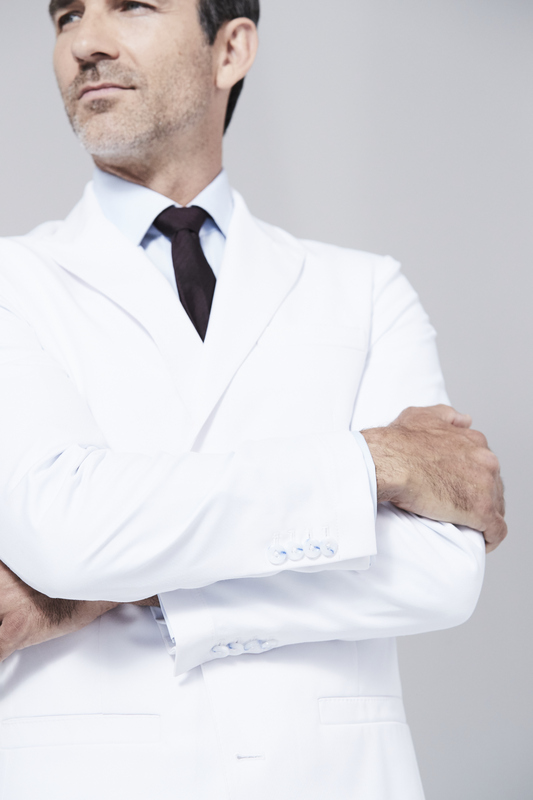 He had considered a white coat, but unfortunately at his hospital the only ones who wear lab coats are the physicians and doctors. 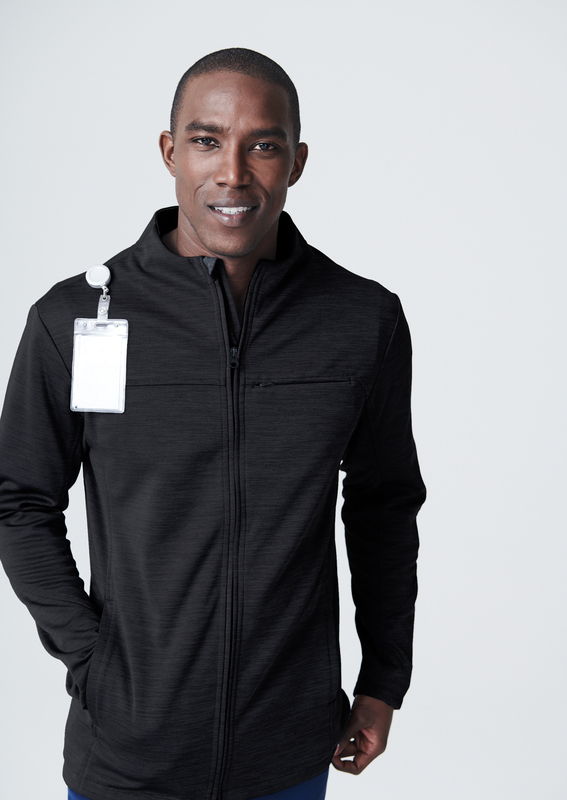 And besides, he wouldn’t feel comfortable wearing a white coat outside of the hospital, meaning he would just need to carry another jacket around for when he goes to the gym or runs errands straight after work. He usually wears an Underarmour jacket, which is great at providing that lightweight layer of warmth and transitioning from work to on-the-go. But this jacket is not made with medical providers in mind, so it also covers up his hospital ID badge and consistently gets in the way when he needs to reach into his scrub pockets for anything. 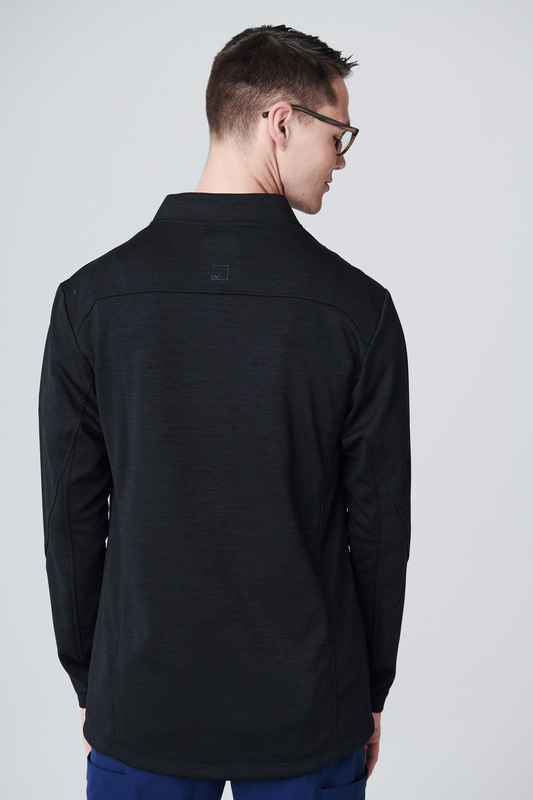 Fortunately for my roommate and male nurses around the country, Medelita just released their Ionic Men’s Scrub Jacket last month and it’s even better than we had expected (we’re talking 8 pockets on one jacket). Check it out below! 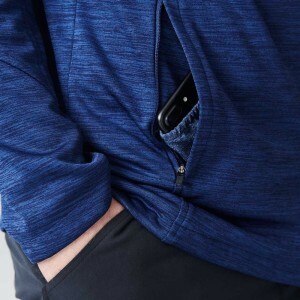 It has pen pockets, sleeve pockets, and even a pocket to affix your ID badge on your shoulder! Shop the Ionic Men’s Scrub Jacket here! This entry was posted in Medical Scrubs, Trends In Medical Apparel and tagged Best Fitting Scrubs, men's scrubs, Scrub Jacket on January 5, 2018 by Ariel Jacoby. If you’re anything like me, you’ve probably already started your holiday wish list of covetable finds and splurge items you’d like to see come the holidays. Making your holiday wish list is not only fun, it’s a practical timesaver that makes it incredibly simple for your friends, family, and loved ones to shop for your holiday presents. If you’re a medical, nursing, or PA student you probably don’t have a ton of money to spend on splurge items, and practicality is key when deciding what items are worth a spot on your wish list. “I got to work and took my new stethoscope! Quickly threw it around my neck, got my report and ran out to the floor. First patient had some diminished lung sounds and, boy, was I surprised that I could hear anything at all – TV in the room was loud and patient on the other bed was talking, but my new accessory apparently has unbelievable noise reduction qualities. You can read the rest of his review here. This entry was posted in Stethoscopes, Trends In Medical Apparel and tagged Stethoscopes on November 16, 2017 by Ariel Jacoby. What capes are to superheroes, is what the lab coat is to physicians. You want a white coat that is a reflection of you, that shows your colleagues and patients that you take yourself seriously. It’s more than just a piece of clothing – it’s a symbol of what you’ve accomplished and how far you’ve come. Right now we’re loving the Rosalyn Lab Coat and the Vera G. lab coat, both from scrubs and lab coats company Medelita, as our top picks for modern professional style…in lab coat form! This entry was posted in Lab Coats, Trends In Medical Apparel, Women's Lab Coats and tagged Fitted Lab Coats, Lab Coats For Women, Tailored Lab Coats on August 7, 2017 by Ariel Jacoby. What a wonderful time to be alive. All it takes is a Google search to find a plethora of lab coats, scrubs, and stethoscopes in all shapes, sizes, materials, and colors. Well, technically a lab coat is meant to be white to represent cleanliness and purity, but there’s nothing stopping you from making your next lab coat purchase stand out with some custom embroidery in any color of your choice! Medelita’s lab coats and scrubs (and now scrub jackets!) can be purchased with custom name and title embroidery, which their team of embroidery artists will complete in-house for a small fee of $12. They have 18 options of embroidery thread in every color family, from blossom and bougainvillea, to teal and slate blue, to willow and seafoam. Scrubs and scrub jackets can be embroidered too, but your color choices will be more limited to make sure the embroidery will stand out. 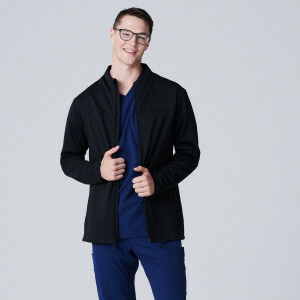 Slate blue is one of the most popular colors for lab coat embroidery, but it would be next to impossible to see slate blue embroidery on baltic scrubs or a navy scrub jacket. Now that Medelita has launched their new line of stethoscopes, we love the idea of getting your lab coat embroidery in a matching color as the tubing of your new stethoscope, or perhaps in complementary colors. 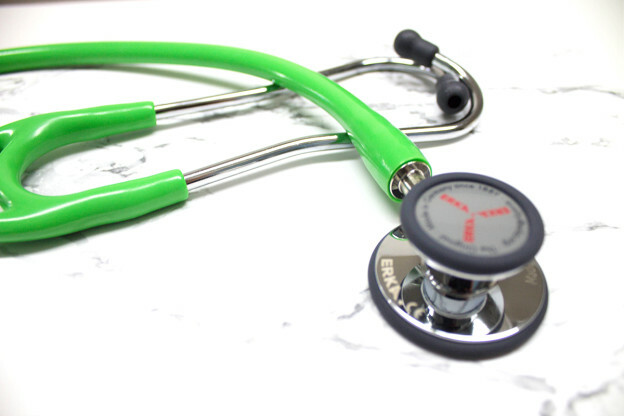 The ERKA stethoscopes available on their website come in three different models, all comparable to Littmann models, that each available in up to 13 different tubing colors. The ERKA stethoscopes also have a solid warranty, and even come with their own stethoscope carrying case so that you don’t have to purchase that accessory separately. 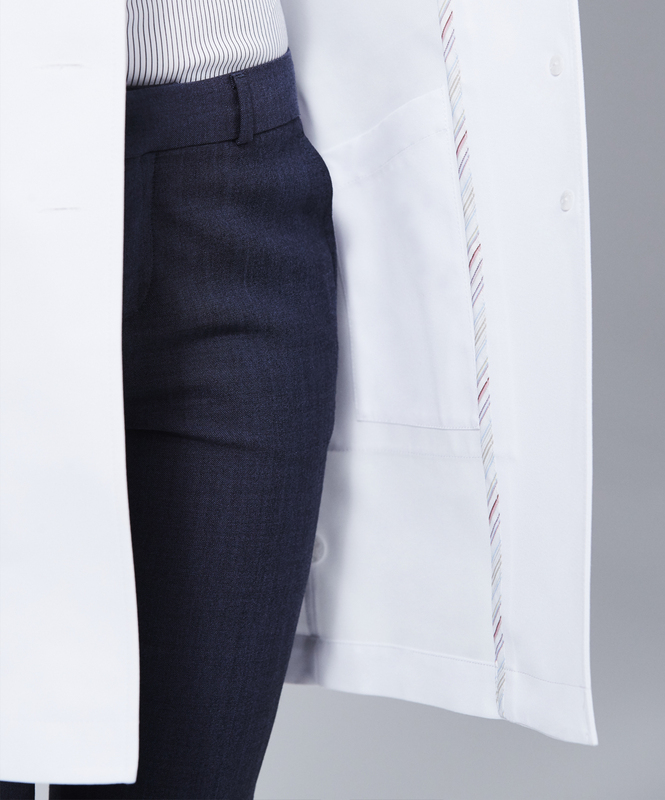 What color embroidery would you choose for your lab coat? Would you ever match your stethoscope to your embroidery colors? Let us know in the comments below! This entry was posted in Lab Coats, Stethoscopes, Trends In Medical Apparel and tagged Custom Embroidery, Lab Coat Embroidery, Stethoscopes on June 13, 2017 by Ariel Jacoby. A new brand of stethoscopes is coming to the US for the first time, and you should be excited. ERKA is a medical instrument company that is well-known in Europe and other parts of the globe, where it sets the ultimate standard for high-quality stethoscopes, and in just a few weeks, you’ll be able to try out three new models of ERKA stethoscopes by purchasing them from scrubs and lab coats company Medelita, which has set the standard for high quality medical apparel internationally. If you know anything about Medelita, you know that they have extremely stringent standards for quality. This is a fact that inspires confidence in the quality of the ERKA stethoscopes, because Medelita is not a brand that would sell products that aren’t of the absolute highest quality. 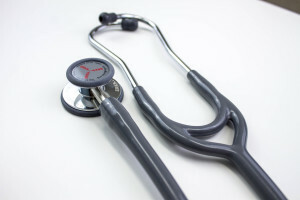 So what makes ERKA stethoscopes superior to the Littmann models? German-engineered products are known around the world for their precision and technical mastery, and ERKA stethoscopes are no different. From the sleek design to the patented dual-membrane sound chamber geometry, these chrome-plated stethoscopes are technologically more advanced than most scopes on the market, as well as being more hygienic. From an aesthetic standpoint, the ERKA stethoscopes are much more attractive and polished-looking than any other we’ve seen. They also have a bit more heft to them, a pleasant weight that is indicative of their quality. 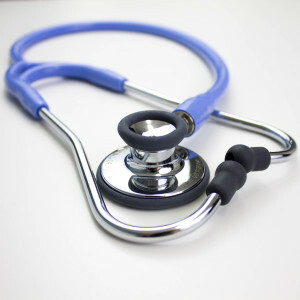 Starting in May, Medelita will begin selling three models of ERKA stethoscopes: the Finesse, the Precise, and the Sensitive. This entry was posted in Miscellaneous, Trends In Medical Apparel and tagged Accessories for physicians, Medical Apparel, Trends In Medical Apparel on April 25, 2017 by Ariel Jacoby. Lately there has been much discussion over medical uniforms and how they serve the purpose of differentiating medical staff members’ roles. Most medical professionals, regardless of level or specialty, wear scrubs. But what about lab coats? Should lab coats only be worn by doctors, or is there something to be said for this nursing lab coats trend? 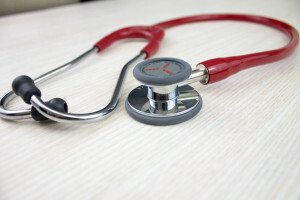 The main argument against nursing lab coats is that it is confusing for patients when lab coats are worn by both doctors and nurses. This is fair, and confusion should definitely be avoided as much as possible. However, there is an easy solution for this if you just get your lab coat with custom embroidery, where you can prominently display your title in a place that’s easy to read. With name & title embroidery on your lab coat, it’s still very easy for patients to tell who is a doctor and who is a nurse: they can just look at your lab coat! We vote that if your white lab coat makes you feel more professional and helps you do your job better, and if there are no hospital rules preventing nurses from wearing lab coats just as doctors, go for it! This entry was posted in Lab Coats, Nursing Lab Coats, Trends In Medical Apparel and tagged lab coats, Nursing, Nursing Lab Coats on December 19, 2016 by Ariel Jacoby.